What’s the first thing people see when they look at your house? Well, obviously the answer is not the inside, it is the outside! Or is it? If it’s dark out, then your visitors may see nothing at all … unless you have outdoor lighting installed! Outdoor lighting is one of the most important investments a homeowner can make to increase their home’s value. If designed and installed properly, outdoor lighting can also enhance the safety and security of your home. Given the long hours that many of us have to put in to commute back and forth to work throughout the DFW Metroplex, extending the useful time to enjoy your deck, patio, or garden is worth the investment. Additionally, with the increasing concern about crime, it is comforting to know that a well designed exterior lighting system may significantly decrease the chance of being a victim. Outdoor lighting of your home creates depth and brings the design of your home and landscape to life at night. Creative Nightscapes can add quality low voltage lighting to your outdoor walkways, patio, trees, and more. 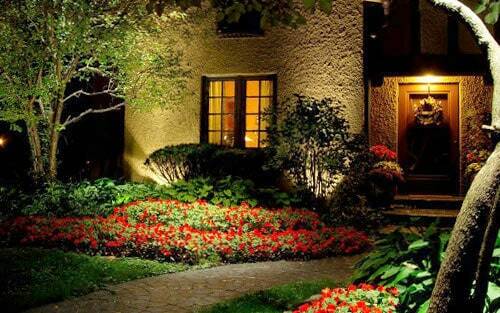 Our exterior lighting solutions provide beauty and security to your grounds and property. Call us for a free consultation and estimate in Dallas, Fort Worth and the surrounding areas. If you’re like most of us, your home is one of the biggest investments you’ll ever make. Landscape lighting extends the time you get to spend outdoors, enjoying your home’s exterior spaces. 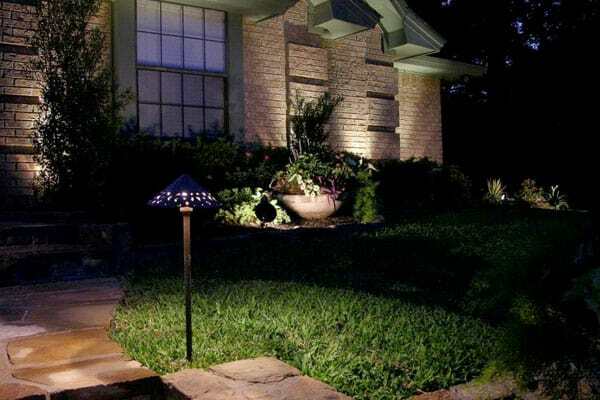 More and more homeowners value landscape lighting because it allows them to extend the enjoyment of their landscape investment into the evening hours. Adding landscape lighting improves curb appeal, expands living space, and increases the safety and security of your home. The right lighting creates a warm and welcoming atmosphere for the exterior of your home and your yard. You’ll even enjoy the glow of lighting from inside the house. You can install landscape lighting yourself or hire a local landscape lighting professional to do it for you. Whichever option you choose, make sure you do your homework before starting the project. First, keep in mind that you should focus more on the desired effect of the landscape lighting, rather than the specific fixtures you use. Second, poor design or installation can make for disappointing lighting. Components are equally as important. Component failure (transformers, fixtures, and wiring) can be a real problem. The best components are not necessarily the most expensive. The key consideration when assessing quality is durability. How long will a component last, given the harsh conditions that exist outside the home throughout the course of the year? Wind, rain, sleet, snow, blistering heat or cold are just some of the hazards your components need to withstand. The landscape lighting system should easily adapt to changes. New landscaping is typically dotted with young plants, bushes, and trees. Does your lighting plan allow for adequate flexibility in the system for easy repositioning of lighting as your landscaping matures, grows or changes? Being able to move the fixture to the correct lighting position as bushes grow, or plants get repositioned, without needing to reinstall part of the system, is an important consideration. If you decide to hire someone to install your lighting, you have a couple of options. Many local lawn services and lighting companies carry a limited selection of landscape lighting fixtures and supplies. They can assist you in simple design and installation techniques but don’t offer sophisticated designs. Electricians will install lights for you, but with little or no design in mind. 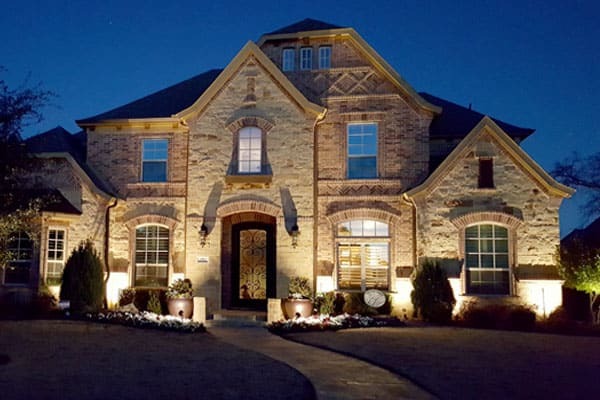 Your best option is a professional landscape lighting design company with thousands of satisfied clients in the Dallas and Fort Worth area that can work with you to create the exact look you desire. If you do not know what you want, they can offer advice based on their experience in design, installation, and maintenance. “Our experts will use special landscape lighting techniques to enhance, secure and accent your property,” says Patrick. Plus, we use Kichler lighting products. Let Creative Nightscapes add new dimension and drama to your outdoor walkways, trees, shrubs with landscape lighting. Whatever the weather, outdoor lighting by Creative Nightscapes will provide beauty, warmth, and security to your grounds and property. Creative Nightscapes specializes in both uplighting and moonlighting for trees. We can create specific portraits of moonlight to graze down on walkways, decks, patios, and driveways. Uplighting will accent canopies of trees to give a beautiful accent of branches, leaves, and trunks. By lighting trees, the homeowners will achieve a sense of depth and proportion to their landscape. 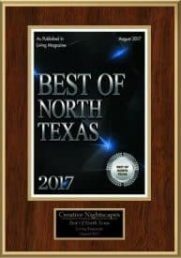 Call the experts at Creative Nightscapes at 817-581-6936 to design and install landscape lighting for your home in DFW area.